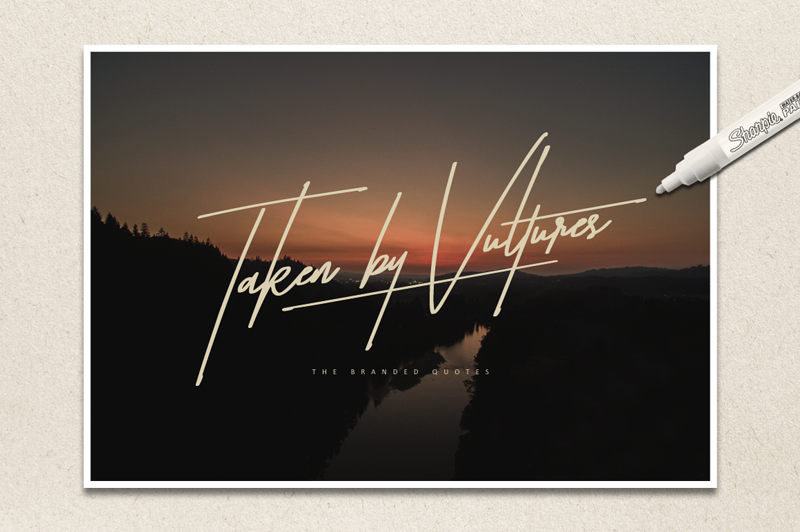 Taken by Vultures - a one of a kind offering to the hand-lettered typefaces with a strong connection to photography and branding. The blending of the most unique-looking glyph. Taken by Vultures can work as your new signature text or as a solid cover to your presentations. Now let your projects standout! Taken by Vultures - gives you the uppercase, lowercase, punctuation, numerals, a ligature and alternates of the font. Don't forget to use the swashes found on some of its punctuation! Taken by Vultures Alternates - the combination of the lowercase regular and some alternates which makes the font more unique! Please check the preview to see how it works. Thank you and Enjoy!